Available in Spider version 2013.10 and above (Post Conference release available end October). 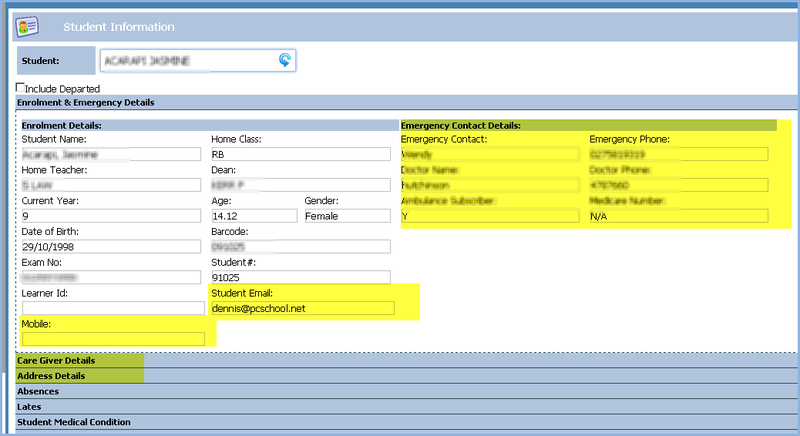 PCSchool has now added the ability to hide or show the student address and contact information from various users. This is done through two new security objects that can be added / removed from the User Rights Equivalence for different users. Address and Contact information hi-lighted in yellow can be hidden or made visible. Two new security objects that can be used to hide or show the contact / address information. If they have ACCESS PERMISSION to 289 then will show the items marked in yellow in above image. If they have ACCESS PERMISSION to 292, then it will always hide the yellow marked info. This entry was posted in Caregivers, Security, Spider and tagged Classroom Management, pcschool, school administration software, School Administration System, School Management System, school software, Split Family, Student Detail, Student Information, Student Information System, student management Software, Student Management System, web spider by studentmanagementsoftware. Bookmark the permalink.